Cornbread can be made quickly, simply, and without a lot of fuss. Importantly it tastes AMAZING. Low calorie is a plus! Preheat your oven to 400 degrees Fahrenheit, this is approx 200 Celsius. 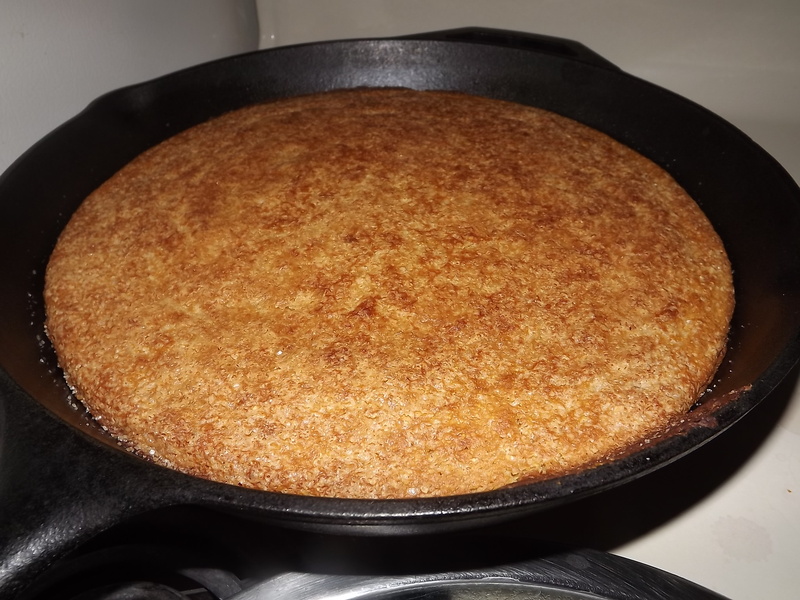 If you are using a cast iron skillet, and you SHOULD, put that in to preheat as well. Add your milk and vinegar into a bowl on the side and let this set for a few minutes, this makes faux buttermilk. If you want you can just use buttermilk instead without the vinegar. Mix together all the dry ingredients in a bowl, if you want to sprinkle some sugar on top reserve about 1 tablespoon. Add your remaining liquid ingredients to the milk mixture. DO NOT mix the liquid into the dry until the pan and oven are preheated. Once your pan is well preheated, remove from the oven and add your 1 tablespoon oil. Spread around CAREFULLY with a heat resistant spatula. Now you may mix the dry and the wet together, try to remove all lumps. Once your mixture is smooth pour it into your pan. Scrape the bowl out and smooth the mixture in the pan if needed. Bake for 25-40 minutes or until a toothpick inserted in the center comes out clean. For me this takes 25 minutes but in my old apartment is took 40, so use a toothpick please! Let cool for 10 minutes. Slice into 8 pieces and serve with butter and honey, yummy! 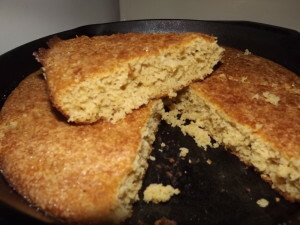 I suggest using less sugar for normal cornbread, unless you intend on it being dessert style. If this is the case add more and also include ½ - 1 tablespoon REAL vanilla extract. 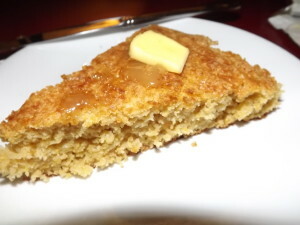 For a yummy texture, take one tablespoon of your sugar and set to the side. When you poor your batter in the pan, sprinkle it on top. Look how yummy it looks!